Even as the weather gets cooler, I'm all too eager to indulge in one of my favorite frozen treats: ice cream! Whether it’s a trip for the entire family or just rewarding yourself by indulging your sweet tooth, there’s certainly nothing like a cold dip to improve your mood. So, whether you’re into soft-serve, gourmet, yogurt, chunky, smooth or maybe you’re craving a good old banana split, here are the places in Indy which will leave you with smile on your face. If you’re looking for good, old-fashioned, local ice cream that is full of flavor, there’s no better place in Indianapolis than Alexander’s on the Square in Noblesville. Alexander’s maintains its ambiance with an authentic soda fountain, 36 different flavors and, of course, some great food, as well. If you ask around for a good ice cream shop in Indianapolis, chances are that the locals will point you towards Handel’s. 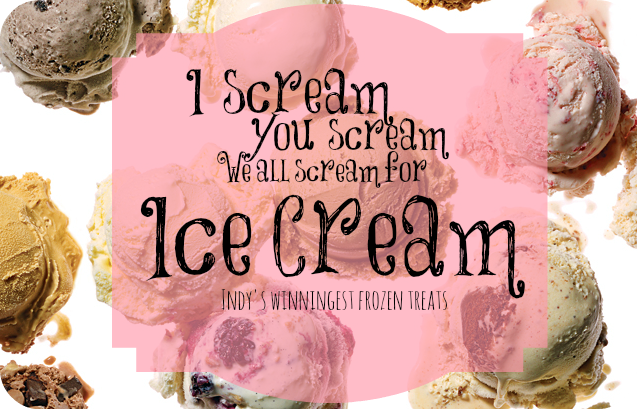 With over 50 years of ice cream making experience, there is no questioning as to why Handel’s was Indiana’s best ice cream shop for 6 consecutive years (2006-2012). Offering over 100 different flavors of their homemade ice cream, Handel’s never skimps on their ingredients, with fistfuls of nuts, sprinkles, and marshmallows as well as fresh fruits and syrups all blended to create an exciting mixture. You may also like to try a scientific approach to your ice cream. Rather than simply freezing their ice cream, SubZero uses liquid nitrogen to flash freeze it. This, according to them, is the reason why their ice cream is so flavorful. The process of flash freezing keeps the milk molecules small, so water doesn’t have time to turn into ice which leaves you with the creamiest and smoothest ice cream that can be made. Mix this food experiment with different flavors, nuts, fruits, and cookies and you get an exciting blend of science and food. SubZero also allows you to choose the consistency of your ice cream. It doesn’t matter whether you like soft serve or if you like your ice cream as hard as a rock. So, call you friends or gather the family, and get a scoop (or more) of these frozen treats. Enjoy!